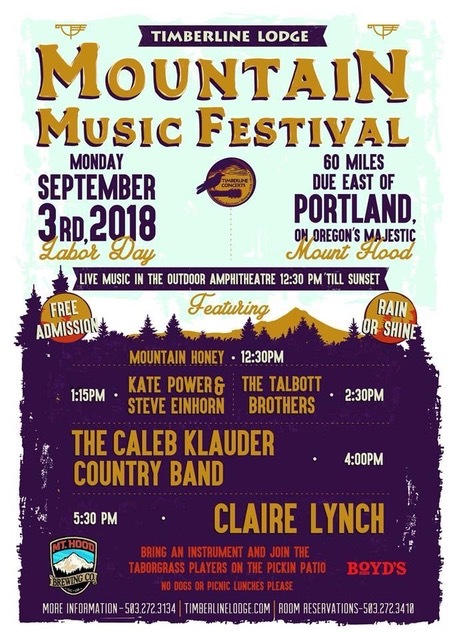 Timberline Lodge Mountain Music Festival, Labor Day, September 3rd. I hope you all can join us for another fun Labor Day spent at the beautiful and historic Timberline Lodge. Linda and myself will be hosting a jam in the back patio starting around 11:30am. Mountain Honey is very excited to be performing as well. We go on stage at 12:30pm at the outdoor amphitheater. This is a free event. There may be a couple of rooms still available at the Lodge if you would like to spend the night. Jamming goes into the evening by the fireplaces. Hope to see you there! Greg. Taborgrass Fall Classes Starting Soon! Jammers Welcome! Mark your calendars. Our Fall classes start on Saturday, October 6, 2018 and go from 10AM to 1PM. Class admission is $15, but we encourage all Taborgrassers - of all skill levels - to come and jam! We have plenty of room for jams in our new location. If you're coming only to jam, we ask for a $5 donation to help cover expenses. Sharon invites beginning and intermediate players to join the String Along Acoustic Jam. What: Acoustic Stringed-Instrument Jam for beginning and intermediate pickers. What type of music: Any basic American Traditional music…(Basic chord progressions). Attention Banjo Players: Start working on your right hand technique now! Attention Banjo Players: It's time to get ready for our fall classes, which will start on Saturday, October 6th. Now is a great time to be working on your right hand technique. Please download "Picking Exercises for Banjo" from our Music page and use it as a practice guide to prepare for our fall classes. If you need assistance with these basic exercises, contact Greg Stone for a free private lesson to help get you started. Fall classes start October 6, 2018 and go from 10AM to 1PM. Class admission is $15. If you're coming only to jam, we ask for a $5 donation.